I have looked all over the internet, I have not seen anyone else have a problem remotely to this. I probably can't search for the right thing, but I'm about to pay someone to figure this out, because I'm completely lost. I had this problem for a year, and I need it on this computer. 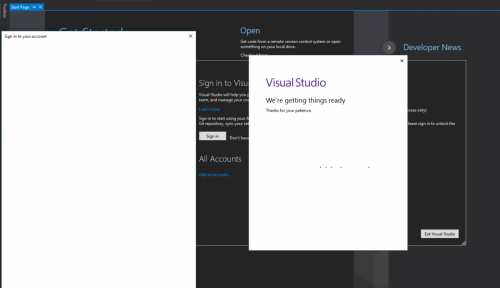 On my personal computer, I have Windows 10 and there's this new thing with all versions of Visual Studio where you have to sign in with a Microsoft account. I tried 2015 and 2017, and in desperation 2012 also. I don't want 2010, I'm trying to upgrade, I actually need 2017. I will also mention visual studio finished a 30 day trial where it worked fine, I might have had a different version then of 2017, but I just need Community 2017. Edited by coolguyace, 26 July 2017 - 07:21 PM. Reset Internet Explorer and then try again. I had a similar problem with Office 365 activation and the reset solved the problem. When I was a student it was hard for me during exams. And only now I learned about nootropics (https://modafinilxl.com/). And this is a salvation during the submission of reports at work.